Well, the sun finally showed its face Friday, I wanted to get the photos completed of my bedroom makeover so I dived in while the going was good. The light wasn't perfect but without professional equipment or waiting till mid Summer, I had to make the most of the natural light. I easily took well over 150 shots (am I a pedantic perfectionist? ), thank goodness for digital cameras! Although I have to repeat I am disappointed with the light. Colours above are not quite true, the fabric for the Roman blind is more beige than grey. 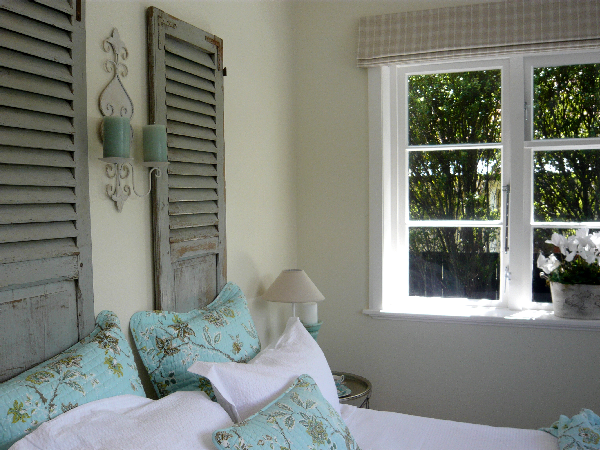 The pair of weathered French shutters are from Yvonne Saunders Antiques. Because they were only 500m wide I chose to have a space between to create better balance to the Queen size bed. 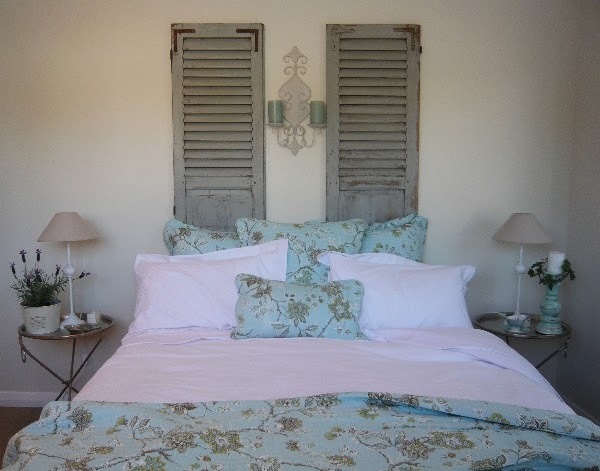 Originally I was going to use an old door behind the bed but the bedroom is not large and I fell in love with the colour of the shutters. 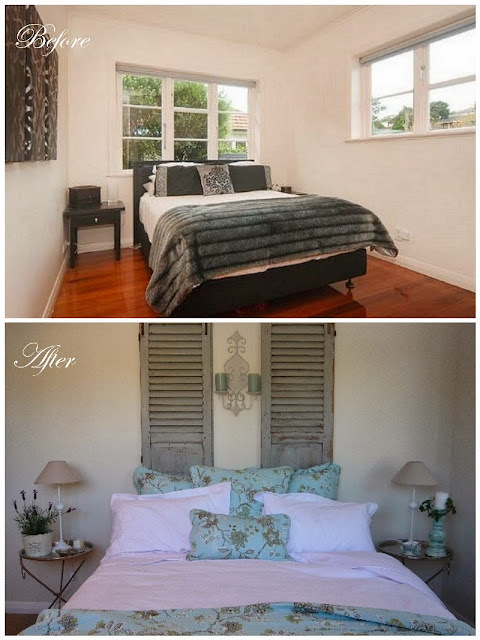 The great thing is if decide to change the look of the room, I can simply get the shutters stripped back to the natural wood. 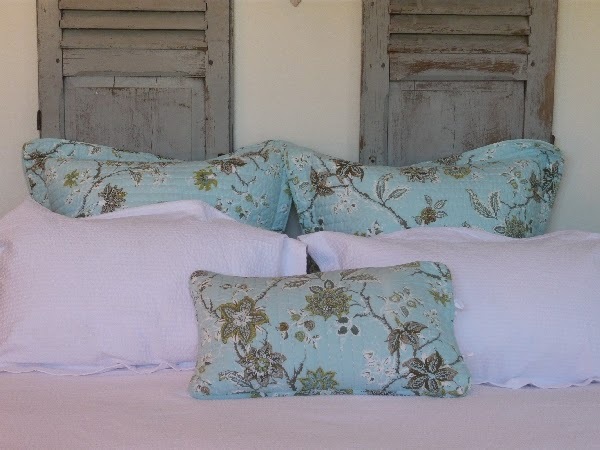 All bed linen is Wallace Cotton the floral quilt and Euro pillows are Paridiso at Wallace Cotton. The Paradiso quilt creates a cottage look to the room and compliments the shutters perfectly. 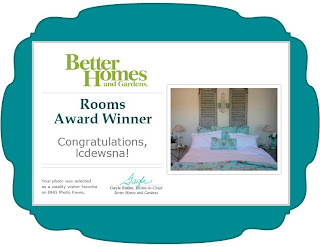 If I'd wanted to give the illusion of more space, then I'd choose all white bedlinen with a little blue brought in with Euro pillows and scatter pillows. However, I have gone for a cosy, cottage look and Paradiso was perfect. I took advantage of the space between the shutters and hung a wall sconce for added interest. 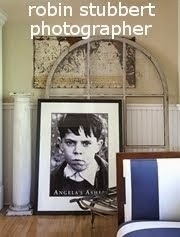 However, I could have left it bare or added a pair of small vertically hung prints. Now looking at this photo it is a little out of kilter so I will have to move it a fraction. The white seersucker duvet cover and pillowslips in cotton percale are also Wallace Cotton. The Roman blinds are beige and white linen. 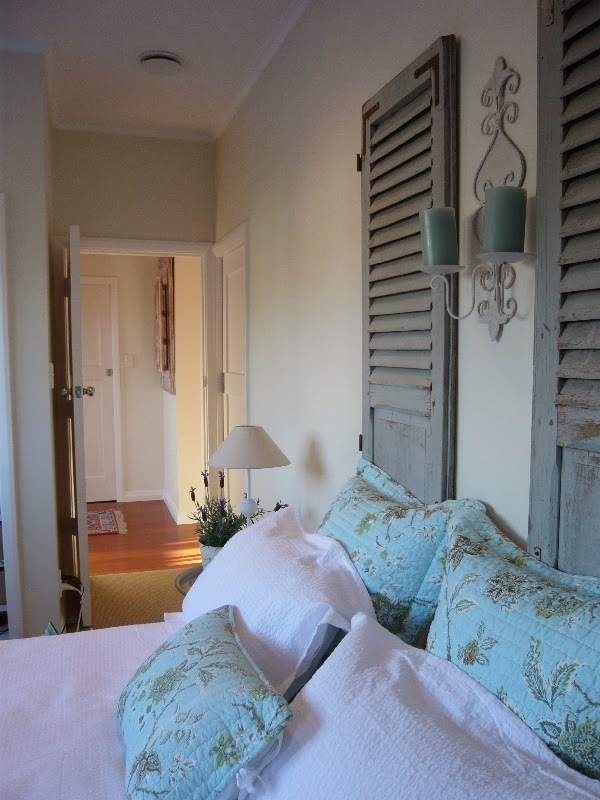 The Lamps are white washed with a natural beige linen shade that tone with the Roman blinds. 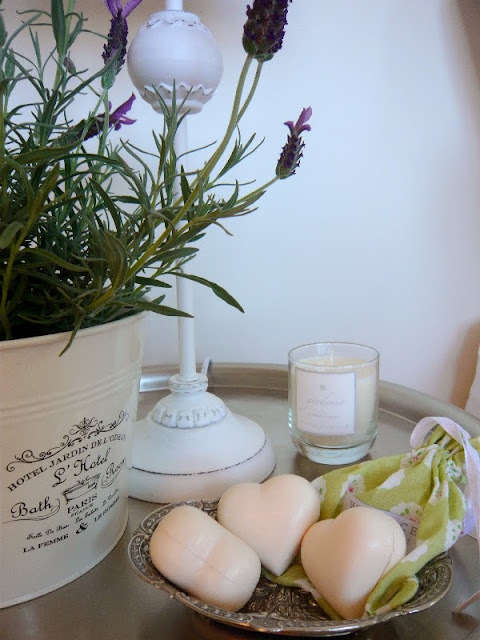 I love the crackled candlestick holder, it reminds me of pretty birds eggs. 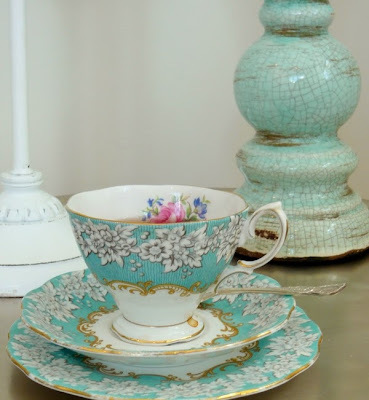 The pretty cup and saucer are Royal Albert and part of a miss-matched collection of cups and saucers my mother gave me. 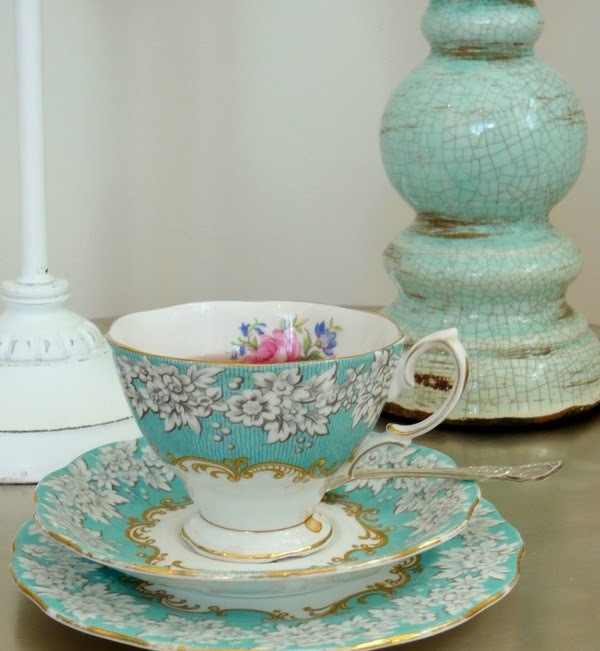 I saw a set recently very similar to this and it was $170 for a cup, saucer and plate!! Maybe I should be displaying it behind glass rather than drinking out of it. 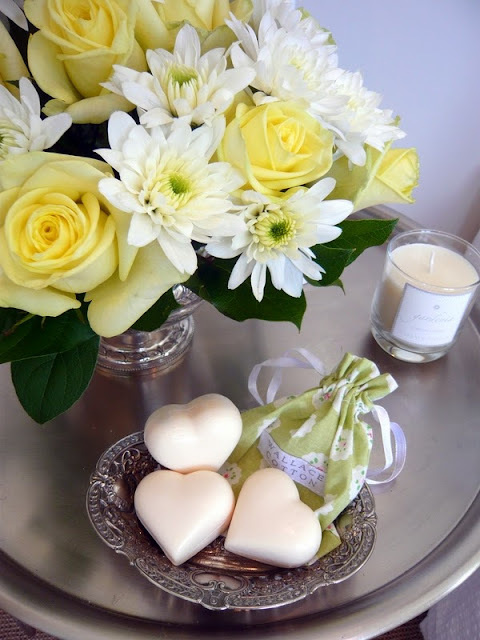 These Gardenia heart shaped soaps came in their own little draw string bag. The antique silver sweet dish is a family heirloom and belonged to my grandmother. These stainless steel tripod tables were originally purchased for my living room, however, they work well as bedside tables. 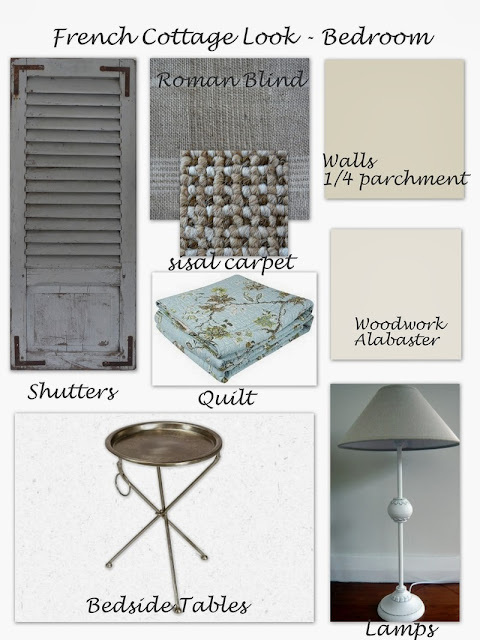 Keeping it simple can sometimes prove best alongside a focal point such as the shutters. 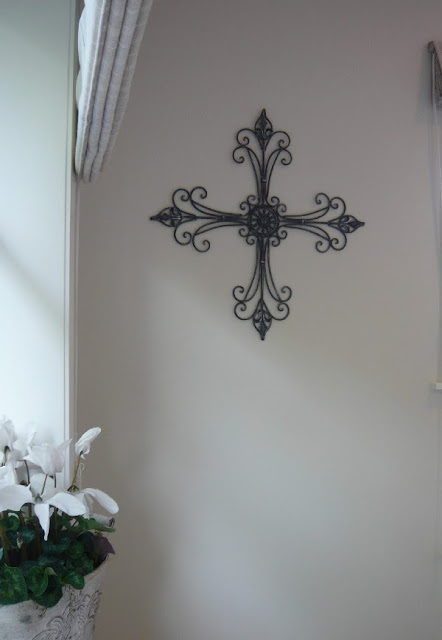 The cross is a recent find in a lovely little shop called Distinctive Linens in St Heliers, Auckland. 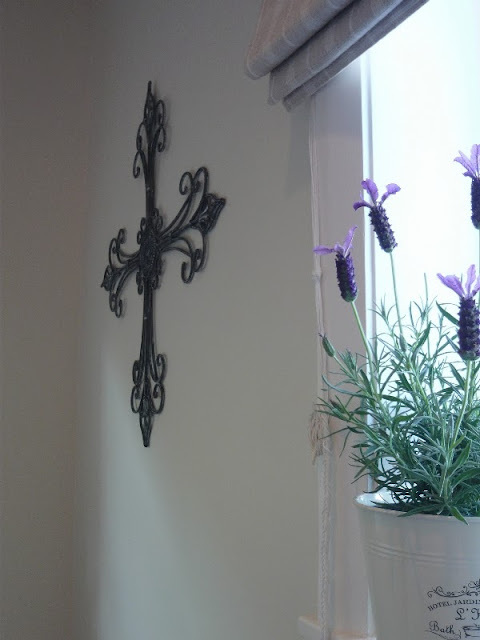 I love the black/grey weathered appearance of the cross, it compliments the shutters beautifully. I feel solid black would have been a little too harsh. I bought this lovely little box to put beside my bed to drop my earrings in at night. I loved the french writing. It was only NZ$12 from Romantique a NZ shop full of beautiful accessories and furniture from France. The Before shot is prior to buying the house, a black and white theme with grey roller blinds. However the white walls and woodwork had a pink undertone which I wanted to do away with so I had the walls repainted 1/4 parchment and the woodwork Alabaster both Resene colours. I repositioned my own bed to face the smaller window. The bedroom is actually wider than it appears in the first photo. 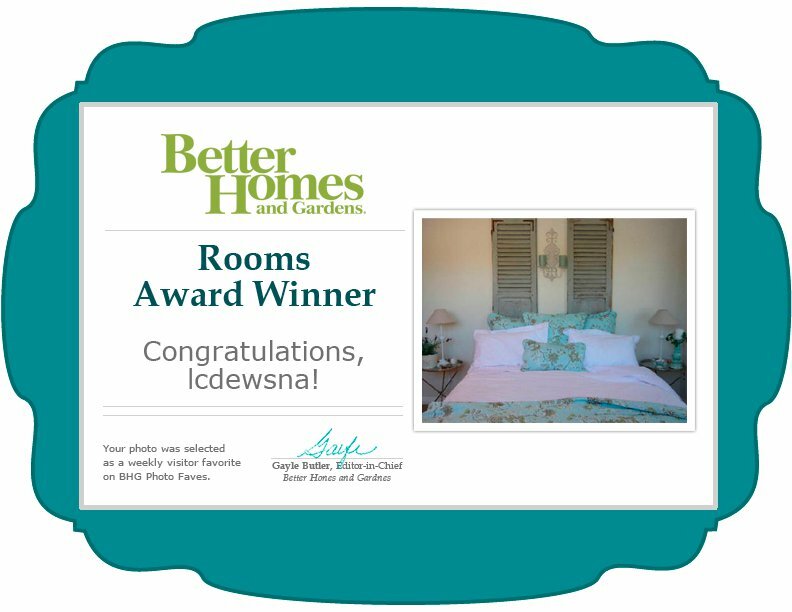 Since I originally posted my makeover, I have been thrilled to receive a "Rooms award" from Better Homes & Gardens. Thank you so much Ruth :)...It sounds like Party Central here in Auckland, the NZ All Blacks have just this minute won the Rugby world cup! Hi Lee - Thanks for your comment. Your bedroom is so pretty, with the soft grays and aqua blue. Nice choices! Thank you Deborah, you have a lovely blog I will be visiting often. 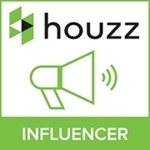 I am doing a makeover on the exterior of my house and plan similar topiaries to the ones you have at the top of your blog. It's beautiful and cozy. I love the colors and your decor style. I'm in love with your floral fabric. I'm your newest follower. Have a wonderful day. Thank you Suffia for your comments, the bedroom is certainly cosy now, just the place for lounging in bed on a Saturday morning with a good book. 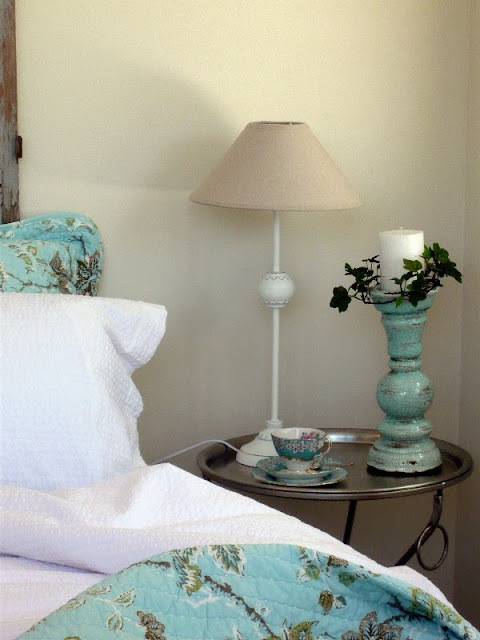 The floral quilt is from Wallace Cotton and called "Paradiso", I think they are still available for sale, they have an online store, the link is in my post. Thanks for linking to our SHOW OFF YOUR COTTAGE MONDAY... hope I'm leaving my message in the right spot as I couldn't find our logo here. Hope this is ok :) The link has been placed on the post now. I'm transforming my wardrobe now, so soon I'll show my little makeover. Thanks for your comment,the before photos are the previous house owners room before I bought it. I definitely need cosy, I am a cottage girl at heart. Can't wait to see your wardarobe, would love to share it when its completed. 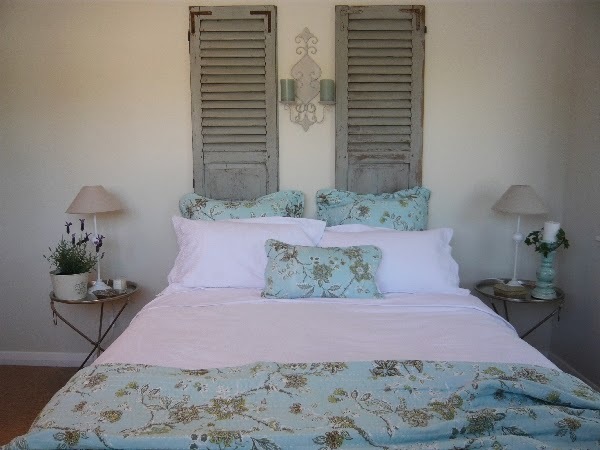 Love this room and those shutters are spectacular! My master br is next on the project list. I took a peek at your paintings...STUNNING! Really really excellent work! Newest follower here, so glad you found me. 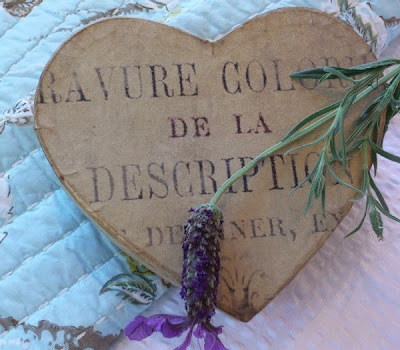 Love your blog, style, and artwork! 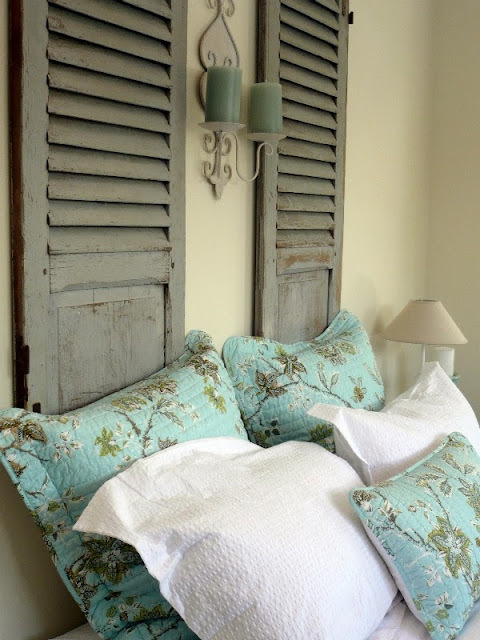 Thank you for your lovely comments, I adore my shutters and plan when I get fed up with the blue to have them stripped back to the old timber. Glad you like my paintings, please come back and visit again, I will be updating my "on my easel page" later today. WoW! What a transformation! 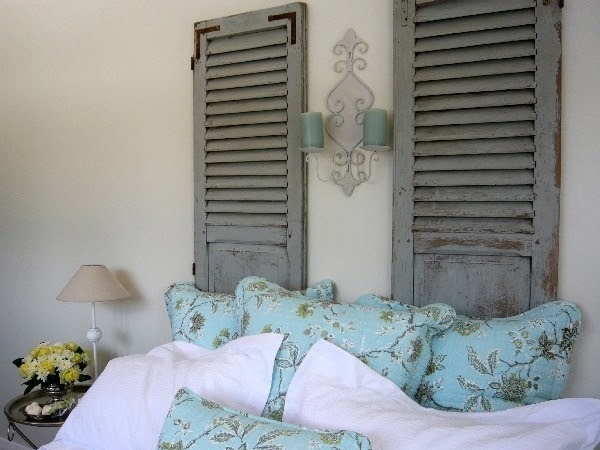 Those shutters are gorgeous. I love your tray side tables, and what a great window over there. So tranquil and chic. Thanks for stopping by the FP! If you posted a comment and it has been deleted the only reason is that the comment is in the form of spam. 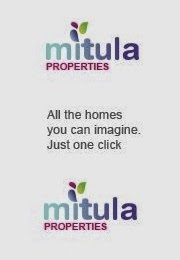 A commercial link may have been attached linking to a business. 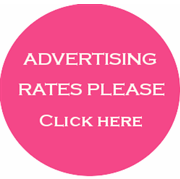 If you have a business you would like to promote on Lee Caroline - A World of Inspiration,and it fits the brand. I am happy to discuss this by email. Please See my home page for contact email address. This French cottage looks vintage and I like it. Big thanks for sharing this with us just to show how beautiful your pieces was. I really like it. thank you for your nice comment, I wasn't really trying to achieve a vintage feel but I guess it does appear a little that way. I am currently updating the bedroom to give it a new look. I hope you might visit again when I post about the update. 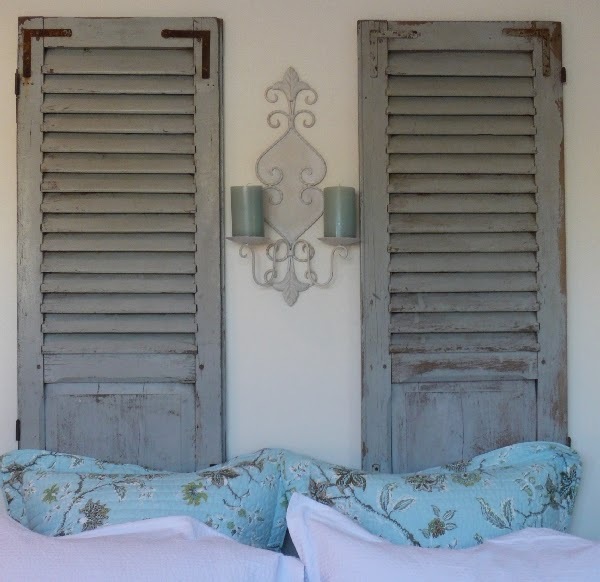 Hi there, I love this and it has inspired me to have a couple of window shutters made to order which I think will look devine. I am searching high and low for a lovely candle sconce like this one, do you mind me asking where you got this from? Hi Jo, Sorry for the late reply, I am not sure where you are situated, I am in New Zealand, the sconce came from a little shop called "The Dovecote" who are in Kepa Road, Mission Bay, opposite Eastridge Shopping mall, unfortuantely she doesn't have a website. I bought them a few years ago. I have removed mine now as I am in the middle of re-doing the bedroom, yet again :). I tend to want to change things from time to time. I had two sconces and one I gave to my friend who is using it at her beach house, mine has moved to the hallway by my entrance. I hope you manage to get something similar. Why are you ready to change this Lee? Thanks Suzan, I am a little bored with it, maybe a little too cottage like. When I moved into the house I had to do this room quickly and had not a lot of time to plan. I want to still keep a French theme but a little more grown up. Sorry for taking such a long time to reply to this comment, I only just realised. Hi Lee, thanks for directing me to this post. The bedroom looks so peaceful. 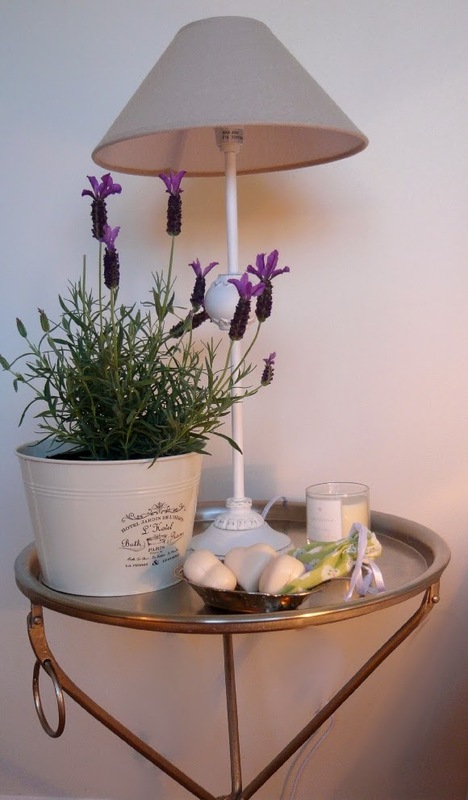 I love the fresh lavender in the room, never would have thought of that! I am curious now about how you are redoing it! I hope you share it with us! Thank you for your comment Khammany, terribly delayed reply, sorry I didn't realise I hadn't replied to two comments on this older post, yours being one of them. I am going to give my room a more grown up look, not so cottagey. 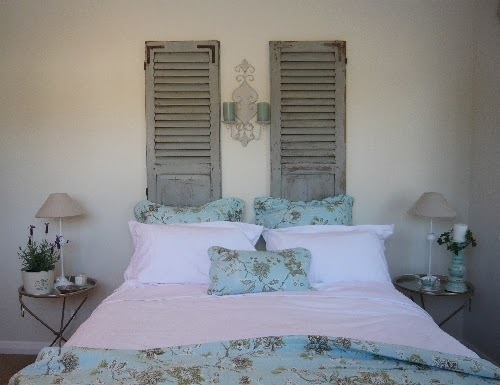 I am going to replace the French shutters with something special, I hope a French Headboard but will see what my budget extends too. I am going to start working on the room next month.